Starting our adventure in New Zealand, the extreme sport capital of the world, worked well. We got our bearings in Auckland and brought Kayla, our new au pair, on board with us. Ferrying around and exploring the North Island and Rotura by car was a blast. We loved everything from traditional Maori dance performances, glow worm demonstrations at night, Keira laughing and clapping over sheep-shearing, to me burning myself with geothermal sulfur water. It was fun. Then, back on our own, we switched to a campervan to check out fresh lakes, waterfalls, glaciers, and pristine beaches. This handy vehicle gave us the mobility to check out remote places and spare us hotels. Nevertheless, there were hiccups in figuring out basics, like making the heat operable and learning the value of a flat parking space. Finally, driving a massive campervan around hairpin turns hundreds of feet above the sea made for a literal white-knuckle experience. Going down a one mile, one-way tunnel without the signal lights working on the way to see Milford Sound definitely gave me cold sweats. Along with adapting to driving this awkward vehicle, Alice and I had to adapt, too, as a couple. We almost killed each other in the campervan’s cozy confines. As you can imagine, after having so many outlets for our own separate personal life (sports, jobs, friends), being enclosed in a small box and spending every minute together challenged our usual dynamic. Not only were Alice and I learning to deal with each other at the start of a supposedly relaxing, fun, and engaging careercation, but we also had to deal with Kayla when she admitted she was homesick and may not be able to continue with us. This caught us flat-footed. We hadn’t even left New Zealand yet, and we had thought she was fitting in with us so well. We thought about it from her point of view. We had been nervous leaving our friends, family, and familiar settings behind in Seattle when we jumped. She must’ve felt the same way. Alice and I talked openly with her, sharing our personal first-time travel experiences—we had been there before and knew what she was feeling. We encouraged her to give it a little bit more time, and we all agreed to have regular check-ins. Happily for everyone, Kayla trusted us and stayed on for the entire time. A great team player, Kayla also enjoyed some of her own independent travel experiences along the way. From the beginning, we’d felt that we hit the “nanny jackpot” with Kayla. However, like any successful relationship, it required two-way communication and understanding. I developed a system of check-ins for the three of us. We used this process between Alice and me and among Kayla and us to discuss highs, lows, things that are on the horizon, and topics to discuss. It reminded me of the kind of managing I like to do at work. Only this time, the payoff in creating a positive culture was not financial dividends, but something even greater—happy, relaxed family experiences. It still comes down to people. Ironically enough, the one adapting the best was little Keira. 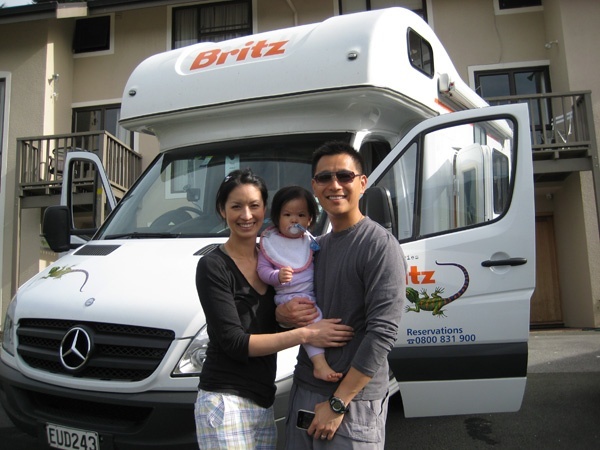 She celebrated her first birthday at a Christchurch RV park. We had a small pastry while we sang to her—but no candles or gifts. Just plenty of love and one fantastic family moment shared. It taught me without a doubt that having children is no excuse to not travel together: they will be far more adaptable than I am. While driving around the South Island, I had plenty of time to reflect on the interviews I conducted on the North Island. The challenge of running a business from a geographically remote country became apparent to me right away. For example, when I told others how long the flight was from Seattle, I expected some empathy. Instead, Kiwis would deadpan, “Mate, we fly that far every time we go anywhere.” I take it for granted that I can hop on a plane and be in New York in about five hours or London and Tokyo in ten hours. The limited market size in New Zealand also struck me. The Seattle metro area has a population of 3.5 million people. New Zealand as a whole only has 4.4 million. So it’s much easier to scale a business in the U.S. when our total domestic market is 314 million people. Another theme that emerged from my interviews is how laws and regulations impact business practices. The U.S. has relatively lax laws when it comes to employee hiring and firing. Kiwi workers enjoy comparably strong protection. Given the legal obstacles to dismissing an employee in New Zealand, business leaders can’t afford to hire someone with the right skills while only hoping that at some point the employee conforms to the company’s values. Many entrepreneurs in New Zealand prefer to prioritize a good fit and then train new hires. The third highlight for me was how quickly these entrepreneurs opened up and shared. I felt like a trusted friend or therapist as they engaged openly. Even though they were all so successful, they never boasted about revenues and profits. Instead, I saw incredible humility. They shared their mistakes and tips, happy to help others who follow in their footsteps. I noticed that I wasn’t alone in my struggles. My challenge around managing people and the burnout I experienced was not isolated to me. Many had experienced something similar or had transitioned out of it, always striving for more happiness in their personal and work life. They shared the human side of starting and running a business—the hard stuff that’s often masked by blogs and books that extol only the fantastic successes. I felt privileged that this group opened up so readily, and I grew even more excited to interview other entrepreneurs in Australia. Near the closing of the conference, we had the privilege of hearing inspirational international speaker Ngahi Bidois give a gripping motivational talk. Expressing so much wisdom, several times he reiterated the importance of people. He quotes a Maori proverb: “The things I have been pleased and privileged to achieve, are not mine alone, but those of many.” It was a fitting theme to embrace at the start of my journey.